See also suggestions for the Psalm. VU267 / W&R20 / A&M711 / SP288 / Lau897 Like a mighty river flowing (Perry) Lovely words of the presence of God in nature. Lyrics and sheet music. Refugees, those who have lost their homes, recent immigrants. *Iona (Psalms of Patience Protest & Praise) / URW343 Beside the streams of Babylon (Bell) Paraphrase of the Psalm, to a traditional Scottish tune which is very simple. PfAS137E God of memory (Richard Leach) Even though this is set to a known tune (EBENEZER) the arrangement and words would lend itself to a more relaxed solo version, with much rubato (that's where you pull the time around so some bits are really slow). 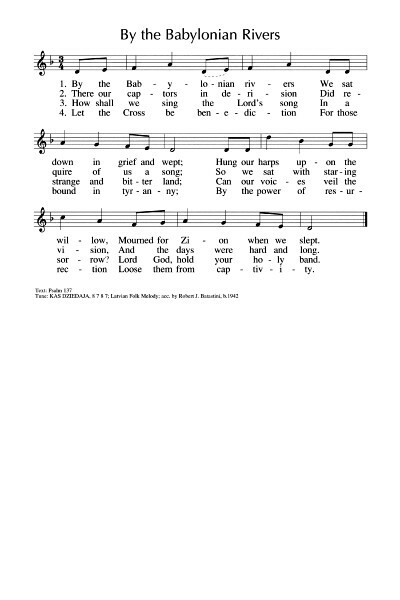 The Sacred Harp When we our wearied limbs to rest (Tate / Brady) There are many tunes for these old hymn words. I really love the tune by Judy Hauff in the Sacred Harp (WOOD STREET). 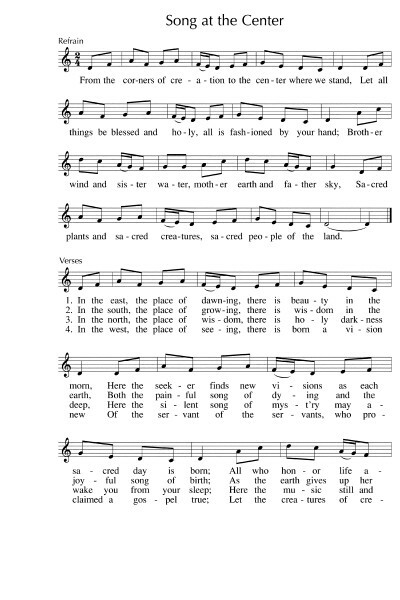 It is not a congregational tune, unless your congregation are Sacred Harp singers, but it's beautiful. Youtube. *CH94 / VU859 / WoV656 / PH246 / GtG072 / RS543 / PfAS137A By the Babylonian Rivers (Bash) Good poetic paraphrase of the first four verses of the Psalm. Latvian folk tune (KAS DZIEDAJA) which is haunting and minor. I prefer this version of the Psalm to TiS85 by Milgate, which uses the same tune. Some versions have 4 verses and some have only 3. Sample sheet music and lyrics. Keyboard sound sample. TiS 708 / ATA 121 / VU858 / StJ / HPP569 / PH245 / CP294 / PfAS137C / URW342 By the waters the waters of Babylon (Traditional) That old round. Could be quite effective as a meditation. VU and URW pair this with a responsive reading of the Psalm which would also work well. Sound sample and lyrics. Good for kids. PfAS137D By the waters the waters of Babylon (Traditional) A versified version of the traditional round. GC(II)573 / G(3)672 / Lau216 By the waters of Babylon (Tate) A different, more contemporary, version. Quite peaceful; good words. Sheet music sample and lyrics. Sound sample. MV016 / StJ / ELW528 / GA430 / SFFS 2157 / GtG466 / HPP410 / G(II)398 / GC570 / GC(II)550 / G(3)637 / RS710 / CP402 / URW378 / Lau701 Come and Fill our hearts/ Confitemini Domino (Berthier) A very familiar Taize chant. Sample and sheet music for practice. AoV1-114 / HPP376 / G(II)430 / GC608 / GC(II)596 / G(3)683 / W&R430 / Lau964 You shall cross the barren desert / Be not afraid (Dufford) Beautiful words. Well known (at least, the chorus). Verses may be tricky. Lyrics. FFS60 Stranger standing at my door Amazing words, but a tricky tune. 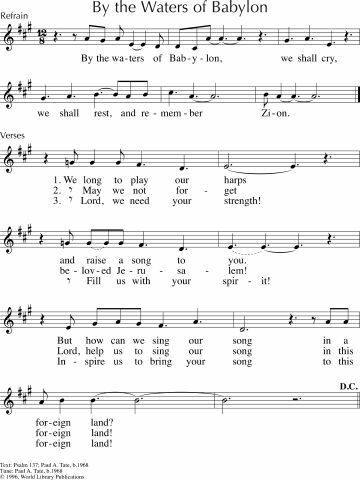 Would be good if you have a good soloist in your congregation who would sing this and the congregation listen to the very meaningful words. Last verse is "I am fearful of your claim, yet I cannot turn away. Stranger with a foreign name, are you angel here to stay? You are messenger and guest, you the Christ I can't ignore, you my own compassion's test, stranger standing at my door; you the Christ I can't ignore." FFS78 Who are these strangers? (Gibson) Good words of questioning faith; quite sad and challenging. The tune is new, but it quite intuitive. "Who are these strangers? Why do they throng, crowding the place where we belong? Why do they haunt us with their pain, eyes that have seen so many slain? We do not know them, yet we kneel and bring them to this holy place, where bread is broken, wine is shared, suffering met by love and grace". Here in this place Come and share this land (Wiltshire) A terrific song to help us learn that sharing our country and freedom is a great thing to be able to do. I think this would be Good for kids sung to ORIENTIS PARTIBUS, but maybe there is a more appealing tune for kids out there? Free sheet music. AoV2-054 / Iona (T1AU, LFB) / MV077 / GtG414 / SFFS 2057 / G(II)438 / GC618 / RS 736 / SP&P111 / PfAS046D / URW409 / Lau909 / StF019 Be still and know that I am God (Bell / Maule) This simple chant is beautiful. Works as a round or in unison. Good for kids. CH716 / VU374 / FFS10 / SFFS 2128 / W&R477 / Cha575 Come and find the quiet centre (Murray) A good song for the beginning of worship. I would prefer to sing this to one of the more traditional melodies offered (Tune 1 in FFS) or BEACH SPRING (TiS 493). Do not be ashamed; rely on God; “guard the good treasure”. MV 162 Christ within us hidden, Christ in all and each (Leunig) Very simple tune with quite remarkable words based on a prayer by Michael Leunig. Why is this in a Canadian song book and not any Australian song books? *sigh* Verse 4 and 5 are particularly appropriate for this week’s reading “Christ, in bodies broken, Love new crucified. Christ, the Word new spoken, death by love defied; Christ, in love recovered. Christ, in hope revealed. Christ, in faith discovered. Christ in tombs unsealed”. AoV2-074 / GA399 / G(II)345 / GC491 From the corners of creation / Song at the Centre (Haugen) Good words of praise in creation and a simple folk-like tune. Partial sheet music sample, keyboard sound sample. *UMH670 / VU418 / CP(E) 438 / W&R708 / 82Hml-347 Go forth for God go to the world in peace (Peacey) Good solid words to a good solid hymn tune. Iona (LFB) He knew the greatness of the small (Iona) This song picks up a number of Bible texts, like this one, about the value of small things. It has an unusual meter and therfore has to be sung to the set tune, which will need to be taught. It can fit well with a responsive reading. A Singing Faith 27 As trees from tiny seeds can grow (Parker Huber) Excellent words to a hymn-like tune. Can also be sung to O WALY WALY. Preview. NCH433 / CH727 / UMH707 / VU703 / HPP474 / GtG250 / W&R515 / Cha638 In the bulb there is a flower (Sleeth) A simple song of hope symbolised in nature. Particularly good for those churches in colder Northern Hemisphere who have a while to go before Spring. Lyrics and sheet music. VU361 / AA123 Small things count (Murray) Good simple song. Good for kids, although there are a lot of words for non-readers. It would be nice to break this song up and sing it to the kids somehow. Good for kids. *WoV658 / ELW506 / URW078 The word of God is source and seed (Dufner) "The Word of God is breath and life; It comes to heal and wake and save. So let the Spirit touch and mend and rouse your dry bones from their grave". Lyrics (downloads a pdf). *MV 174 Soil of God (Holy Ground) This is probably most appropriate for last week’s reading, but would also fit for this week. The tune is quite simple and the words are good “Soil of God, you and I, stand ready to bear seeds of faith nourished by God’s tender care”. *Tune In: Kingdom Come (Lees). A song about what the kingdom might be like, with plentiful images from the parables. Sample and lyrics here. *Taizé / AoVNG125 / MV146 / GC(II)637 / G(3)740 / PfAS024D The Kingdom of God is justice and peace and joy in the holy spirit (Taize) "Come, Lord and open in us the gates of your kingdom". A nice joyful Taizé chant. Sheet music and sound samples of parts for practice. Good for kids. UMH275 The kingdom of God is like a grain of mustard seed I don't have this hymnbook, so don't know what the tune is like, but the words are fine. Lyrics. Recorded music From little things big things grow (Paul Kelly) This tells the story of a Native Title claim which has very little to do with this reading except the acknowledgement that small steps can achieve something big. There's also a children's book based on this song which could make a good story for kids. AoVK-28 / ATOK 376 Faith hope and love (Watts) This is so easy, and so cool. If you have some groovy musicians, this can even be a very funky rock song. Very easy, and great for kids and non-readers. Good for kids. GtG176 If you only had faith / Si tuvieras fe (Caribbean / Sosa) A fun Caribbean song in English or Spanish. Good for kids!